~: Where the Jakarta Stock Index goes? In August 2011 Jakarta Stock Index reached its highest point at 4195.72. Index in Muslim-majority countries are typically rise during Ramadan because of high consumption. Then down through the 20-day MA line, continuing down through the line 50-day MA. 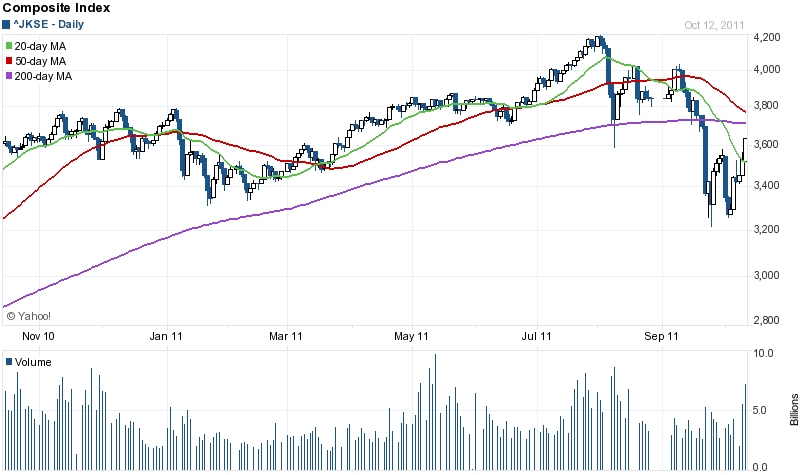 Down to touch the 200-day MA, this seems a psychological point experienced by brokers as support point. They agreed that the index is too cheap, so some brokers do buy back and lifting index to rise above the 50-day MA and reached its highest point when it hits the 20-day MA, as resistant point. Then the index tried to penetrate the 20-day MA before it finally fell through the 200-day MA. Month of October 2011 index back up beyond the 20-day MA, if capable to rise above the line of 200-day MA, up above 3800, then the index will likely continue to rise until December 2011. Trading volume is also quite high in October 2011.